An All American favorite during the summer and relatively quick and easy too! For a red, white and blue 4th of July dessert, add blueberries to the mix. Drop the dough in 6 equal portions onto the prepared baking sheet. Lightly pat the dough into rounds—3 to 3 1/2 inches in diameter. Place strawberries in a bowl. Sprinkle with lemon juice and sugar, then gently toss with a rubber spatula. To serve, slice off the top third of each shortcake. 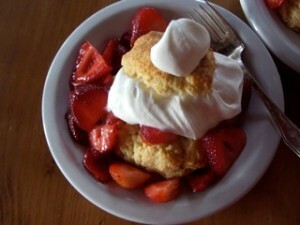 Place the bottoms on 6 plates and top with 1/3 cup of the prepared berries and juice, plus a spoonful of whipped cream. Cover with the top. Spoon over more berries and juice, then dollop with whipped cream. Garnish each with a whole berry and drizzle with any remaining juice.